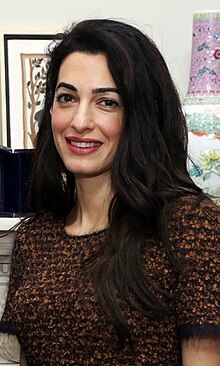 ^ "George Clooney engaged to Amal Alamuddin: Actor to marry British human rights lawyer who has represented Julian Assange", The Independent, 27 April 2014. ^ "George Clooney engaged to high-flying British lawyer", The Telegraph, 28 April 2014. ^ "Colleges, Halls, and Societies: Notices – St Hugh's College" 页面存档备份，存于互联网档案馆, The Oxford University Gazette, 23 October 1997.